Wow, wow, WOW! What a beautiful week in Val d’Isère with YSE Ski and the West family. Incredible weather and skiing, a gorgeous chalet of guests and the most delicious food. I’m feeling so energised, relaxed and full of life! When friends/family asked me what I would be eating on a week’s skiing holiday, I have to admit I wasn’t sure! YSE were very accommodating and I paid a small supplement of £25 to cater for my dietary requirements. A few years ago I would have felt uncomfortable about being singled out or treated differently but after nearly 27 years of managing my condition, I’ve realised that there’s no reason why you shouldn’t be able to feel your best at all times, particularly on holiday! These companies are there to make your holiday more enjoyable and YSE and the West family couldn’t have been more welcoming of my quirkiness! Amelia (Mimi) Cheer was the most amazing chef and produced a stunning, three course meal each evening, which was gluten free and plant based. I asked Mimi if she would be happy for me to feature her ‘Toto friendly’ creations on here and I’m delighted to say that she said YES! More from Mimi shortly. At the start of the week, Mimi and I had a good chat about more specific requests, for example breakfast options and canapé ideas. Each morning before a day on the slopes, I opted for two slices of gluten free toast with either smashed avocado or a selection of jams, usually with some fruit on the side. I wanted something which was easy to digest and more carbohydrate based to fuel the six hours of skiing that would follow. I brought protein bars out here with me and I enjoyed one with our mid-morning coffee up the mountain.Lunches were typically up the mountain and this is where I found it the most challenging. Luckily my French is still fairly respectable (don’t worry if yours isn’t – they all speak English in ski resorts!) and I quickly worked out that simple was better when ordering in restaurants. I usually opted for a large salad, a soup or if nothing else was available, a big plate of chips! I found an amazing café in the centre of Val d’Isère on Mimi’s and our two host’s recommendation – Arctic Juice & Café is the world’s first ‘mountain energy café’ and I was in complete heaven. 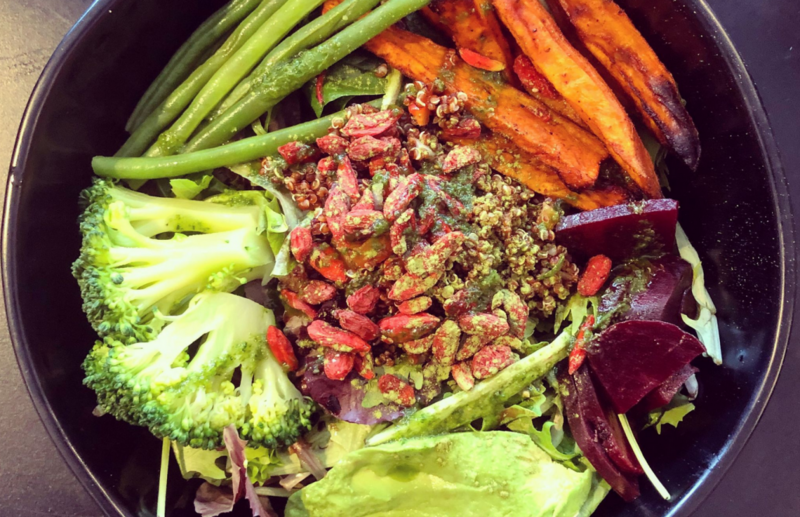 Their superfood salad and green endurance juice left me feeling on top of the world! After a boogie and a gin and tonic (or two…OK maybe three!) at Après-ski, afternoon tea would be waiting for us at the chalet on our return. Mimi made me a beautiful ginger cake topped with fruit, as well as some delicious shortbread. Indulgent, yes but much needed after all that dancing! So, the bit you’ve probably been waiting for. Here is one of the menus which the wonderful Mimi created and the recipes so that you can recreate them at home! To make the chutney, in a saucepan fry off the red onion in a little oil until soft. Add the sugar and a little water and leave to simmer until the mixtures starts to become sticky. Add the harissa paste and continue to simmer until the mixture is lovely and soft and sticky. Add the vinegar, season to taste. and allow the chutney to cool before serving. For the falafel, in a large frying pan sweat off the shallots in a little oil for 5-10 mins until soft. In a food processor, combine the chickpeas, defrosted peas, cooked shallots, fresh coriander and spices. Pulse until roughly mixed – you want it to be still chunky and textured. Season to taste with salt and pepper. Shape into 8 evenly sized patties. In a frying pan on a medium heat, heat up enough vegetable oil to cover the bottom of the pan. Fry the falafel on each side until golden brown. Serve the falafel with the harissa chutney, sliced, cooked beetroot and orange slices. Heat the oven to 190 degrees Celsius. Half the courgettes lengthways and scoop out the seeds creating a shallow boat shape. In a bowl, toss the potatoes in a little oil, salt and pepper. Place the courgettes and potatoes on a lined baking tray and bake for 20 minutes. Whilst the courgettes are cooking, add the quinoa and 2 cups of water to a saucepan and bring to the boil. Turn the heat right down, cover with a lid and simmer until all of the water has been absorbed. Add the juice of 1 lemon and stir through with a fork. Remove the courgettes and potatoes from the oven. Fill the courgette boats with the quinoa, add the vine tomatoes to the tray, sprinkled with salt, and return everything to the oven for a further 20 minutes until it is all completely cooked. For the lentils, sweat off the red onion in a little oil until softened. Add the chopped tomato, followed by the lentils. Add the smoked paprika and season with salt and pepper. Cook through until the mixture is nice and hot. For the pea purée, simply combine the defrosted peas, avocado, lemon juice, water and garlic in a food processor. Blend until almost smooth and season to taste. Present the dish as beautifully as Mimi has below! Preheat the oven to 110 degrees Celsius and line a baking tray with parchment paper. Using an electric whisk, beat the chickpea water until it forms soft peaks. Add the sugar a little bit at a time, whisking constantly until the mixture becomes thick and glossy (this can take up to 10 minutes). Spoon or pipe the meringue mixture on to the baking tray in 8cm blobs. Bake for 1 hour 15 minutes (I like to layer the meringue mixture during the cooking process to give it more height). Leave to cool completely. To make the coulis, simply combine the berries, orange zest, water, sugar and orange juice in a saucepan over a medium heat. Bring to a boil and heat for 8-10 minutes. Remove the mixture from the heat, purée with a blender and strain the mixture into a jar to remove the seeds. Allow to cool completely before serving. Serve the meringue with finely sliced, fresh fruit and a drizzle of coulis. An enormous thank you to Mimi for sharing her talents on Totoly Nourished and for making my skiing holiday stress-free and beautifully satisfying. I also have to mention Miranda and Anna, our superstar chalet hosts for the week, who were always smiling, helpful and huge fun to be around. The girls were a dream team and have completely inspired me; the temptations of a ski season are so strong right now! Don’t be afraid to ask – Travel companies and hotels are there to make your holiday as enjoyable as possible. Whether it’s dietary requirements, restaurant recommendations or simply asking for bigger/smaller portions, if you don’t ask, you don’t get. Feel the fear and do it anyway! Pack a snack – My protein bar was the perfect mid-morning boost and kept me going until lunch. It’s always nice to have something to enjoy whilst your ski buddies tuck into a Twix and a chocolat chaud up the mountain. Preparation is key – Similar to the above, if there are any ‘must haves’ which you can’t live without for the duration of your holiday, bring them with you! The supermarkets are fairly limited in ski resorts so make sure you pack your beloved granola, chia seeds or gluten free oats in your suitcase if you want them to hand during your stay. Hydrate – It sounds simple, but taking a water bottle with you in a rucksack is not only better for the environment (I dread to think how much plastic is consumed in ski resorts) but you can easily forget how much energy and hydration you need to fuel and recover from a big ski day. Keep it close to you during Après too; there’s nothing worse than a sore head before dinner! Stretch it out – Skiing can be hard on the body, particularly your knees, glutes and quadriceps. It is so important to stretch before and after you ski, particularly if you haven’t used those muscles in a while. I managed to squeeze my yoga mat into my suitcase and set my alarm a little earlier to do a quick flow before breakfast, with a quick roll around on the living room floor before tea. I also had a long soak in a hot bath every evening, which was an absolute saviour! Give yourself a break – A holiday is supposed to be enjoyable. For me, this has meant a lot of dancing, singing and the most gin (and Génépy…) I’ve had to drink, possibly ever! I don’t advocate alcohol in my nutrition clinic but what I do encourage is having fun. I never went overboard this week but I have definitely eaten less vegetables, more sugar and a lot more booze than I normally would do but do you know what, I feel surprisingly fantastic for it! A week isn’t going to make all of the wheels come off – enjoy yourself and remember that moderation is key!